Overview: This web conference brings together key strategists, decision makers, and nascent local innovation across academia, government, law enforcement, and cyclists for a respectful, frank and open discussion. "On average, in California over 13,000 cyclists are injured and over 140 are killed each year in traffic collisions. Last year in the Bay Area alone, over 2,700 cyclists were injured in collisions, and 21 cyclists were killed." The California Highway Patrol Golden Gate Division shared these shocking statistics on 10/5/15 in their press release "Three Feet For Safety – CHP Focusing on Keeping Cyclists Safe". Near Miss and Perceived Risk Research in the US and the UK shows Near Misses are orders of magnitude more frequent than collisions, more cyclists stop cycling because of Near Misses and Perceived Risk than collisions, and potential cyclists don't ride because of Perceived Risk. CalTrans has a goal of tripling the number of cyclists by 2020 but neither CalTrans nor the Metropolitan Transportation Commission (MTC) use Near Miss data in their cycling safety analysis and planning. They only have collision data. Cyclist created incident reports at www.CyclistVideoEvidence.com are designed based on the academic research to provide Near Miss and Perceived Risk data for cyclists, law enforcement and government. 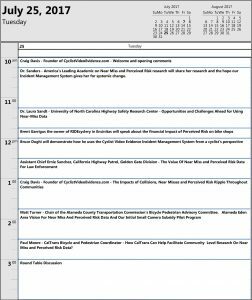 How could government transportation planners use Near Miss and Perceived Risk data in their cyclist safety analysis and planning? How can government agencies help facilitate the production of Near Miss and Perceived Risk data from cyclists? How many collisions could have been prevented if Police cited drivers for egregious Near Misses such as Assault and Reckless Driving? How many collisions could have been prevented if we identified repeat offenders before they hit a cyclist? Does law enforcement even cite drivers without a collision? What is the criteria for Assault and Reckless Driving using cyclist video evidence without a collision? Why was our egregious Castro Valley incident not cited for anything but our egregious Glendale incident was cited for 2 counts of Assault when they both use the same California laws? How could academic research use Near Miss and Perceived Risk data? Dr. Rebecca Sanders, a leading American academic on Near Miss and Perceived Risk research, says this gives her hope for systemic change. Dr. Sanders will speak on her research and participate in our roundtable discussion during our last hour. The California Bicycle Coalition Facebook post stated: "Could video evidence deter dangerous driving? This new site could completely change how we hold drivers accountable for near misses and illegal, aggressive behavior." Rebecca Sanders, PhD, is the Head of Research for Toole Design Group (TDG), where she focuses on perceived and actual safety and mobility for pedestrians and bicyclists. She is currently helping several Vision Zero cities, including Eugene, Seattle, Denver, and Boston, understand and address pedestrian, bicyclist, and motorist safety. She is also working on several projects to analyze perceived and actual safety for pedestrians and bicyclists at intersections, along sidepaths, and on protected bicycle lane corridors. Prior to working at TDG, Dr. Sanders worked for UC Berkeley’s Safe Transportation Research and Education Center for seven years, where she conducted a multi-year analysis of California crash data and developed performance measures for pedestrian and bicyclist safety and mobility for Caltrans. She is well known for her research exploring drivers’ attitudes and behaviors toward bicyclists, particularly with regard to infrastructure. She also conducted the first North American study of near misses, finding that fears about bicycling are significantly related to near miss and collision experiences. Dr. Sanders is a member of the Transportation Research Board's Bicycle Transportation Committee, Co-Chair of the TRB Bicycle Research Subcommittee, and serves on the ITE Vision Zero Technical Working Group. Paul is in the Bicycle Facilities Unit that is responsible for the Caltrans Bike Program. The Bicycle Facilities Unit acts as the Department’s bicycle advocate. That unit’s objective is to improve safety and convenience for bicyclists. The unit also provides policy, funding, planning and technical expertise in bicycle transportation and is in consultation with federal, state, and local transportation agencies, Caltrans headquarters and District staff, legislative staff, and the public. Our Castro Valley incident was a focus of our early work and in partnership with the Golden Gate Division we worked through a long and sometimes difficult path determining CHP's ability to cite drivers using cyclist video evidence. We do not always agree but we work for common ground and are honored to have Assistant Chief Ernie Sanchez participate in a respectful, frank and open discussion. Based on the Glendale Assault conviction we hope to learn criteria for Assault and Reckless Driving using cyclist video evidence. Our focus for this session is to discuss the value of Near Miss and Perceived Risk data for law enforcement. Local Innovation including our Alameda Eden Area Camera Subsidy Pilot Program. Chair of the Alameda County Transportation Commission's Bicycle Pedestrian Advisory Committee. Constituent Liaison for Alameda County Supervisor Nate Miley. Matt frequently bikes the parks and cities of the Bay Area with his two young children in tow. He is an outspoken advocate for significant mode shift through safe and inviting infrastructure design. Brent is the owner of RIDEcyclery in Encinitas. 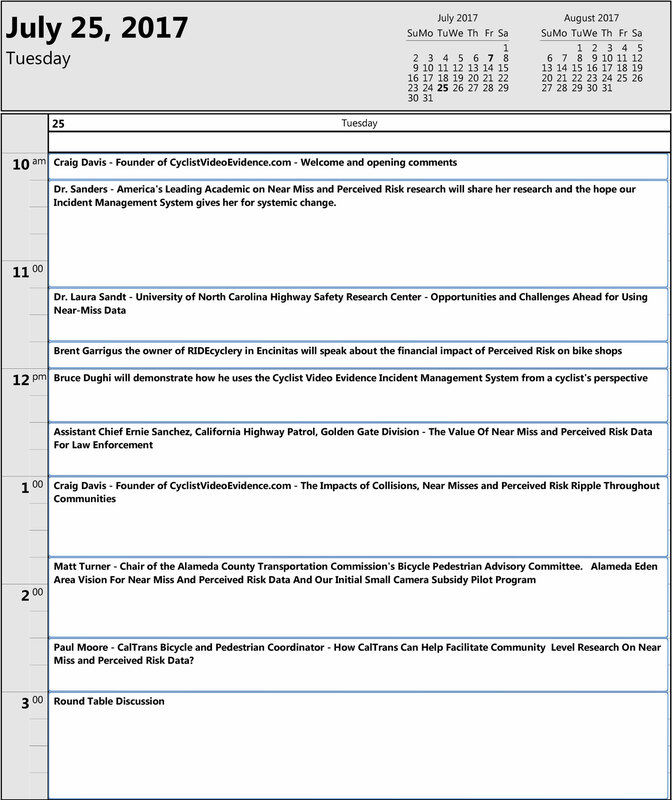 www.CyclistVideoEvidence.com user will share how he uses the Incident Management System. Bruce Dughi is an active cyclist in Castro Valley, CA, recognized in the community by his tag along 10 yr old twin daughters. The girls displace more than 3,000 VMT (vehicle miles traveled) annually by riding to school, track practice, dentist/doctor, shopping etc. Bruce co-founded BikeWalkCV (Castro Valley) in response to his son's bike collision with a car. He is an active participant in the Alameda County Bike/Pedestrian Advisory Committee. He is the Safe Routes to School Coordinator and member of the Safety Committee at Castro Valley High School. The school district presented him with an award for helping to get a stop sign installed near the high school. Bruce also actively participates in CHP's education letter program, where the CHP sends out a letters on his behalf as a response to near miss complaints. His goal is to make cycling more attractive to families by making it safer. Craig Davis is the Founder of www.CyclistVideoEvidence.com. Cyclists and their families are most impacted by collisions but the impact is felt throughout communities from law enforcement resources, to hospital resources, cycling retailers and manufacturers, and health and auto insurance companies. Near Misses are orders of magnitude more frequent than collisions and the academic research states that more cyclists stop cycling because of Near Misses than collisions and potential cyclists don't cycle because of Perceived Risk. This session will identify the magnitude of the ripple effect and how Near Miss and Perceived Risk data can help mitigate the effect. Speakers will participate in a round table discussion and answer questions from the audience. Your registration will be approved when your payment is confirmed. Please let us know if you have any questions by using our Contact Us form in the menu above. We look forward to your participation in this important web conference.